What is the ultimate Father’s Day gift? Is it buried treasure, or is it spending time with loved ones? Why not both? This year, give Dad a guide to a hobby you can enjoy together. In Razor Clams, David Berger shares with us his love affair with the glossy, gold-colored Siliqua patula and gets into the nitty-gritty of how to dig, clean, and cook them using his favorite recipes. In the course of his investigation, Berger brings to light the long history of razor clamming as a subsistence, commercial, and recreational activity, and shows the ways it has helped shape both the identity and the psyche of the Pacific Northwest. Washington State has many symbols – a state song, a state bird, a state tree – and now a move is underway to designate the Pacific razor clam as the state clam. Coastal legislators Brian Blake, Joel Kretz, Steve Tharinger, and Jim Walsh introduced House Bill 3001 in February and they plan to reintroduce the non-partisan bill again during the next legislative session. 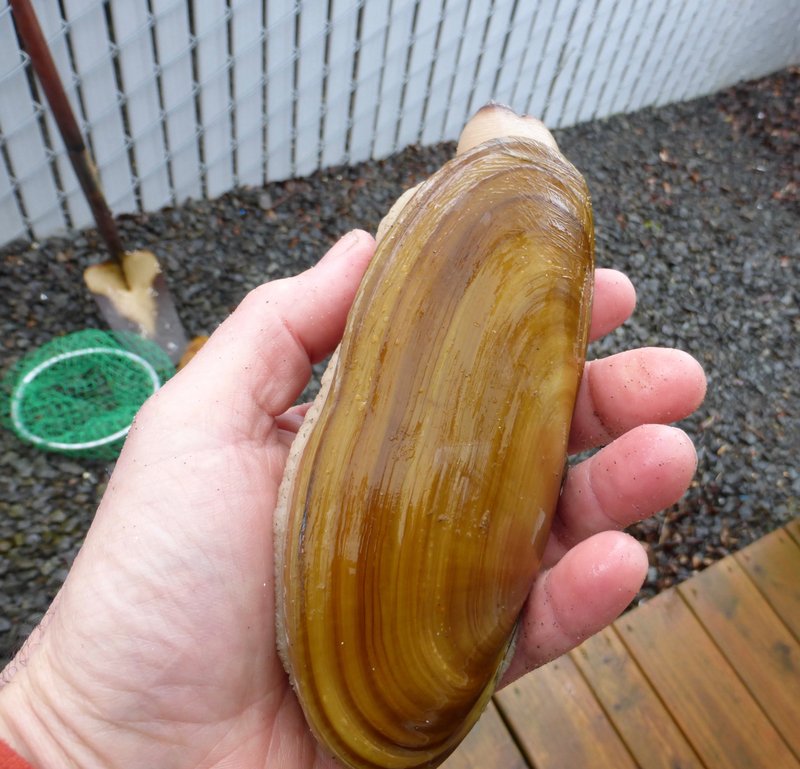 Rep. Blake, a razor clammer since childhood, says the Pacific razor clam well deserves the official title of state clam for its significance to the state’s history, identity, and economy. What drives thousands of people to Pacific coast beaches every year, regardless of the season or the weather? The unique activity known as razor clamming: chasing after the delectable Pacific razor clam, endemic to the West Coast and especially numerous in Washington, Oregon and south-central Alaska. When I first moved to Seattle, I had heard something about the near-mythic activity of razor clamming, and one year I finally tried my hand. I was startled to find a horde lined up on a sandy beach near Ocean Shores, Washington, lanterns and headlamps bobbing in the pre-dawn darkness like so many fireflies, waiting for the low tide. I only managed to get one clam that dig, but I became an aficionado. Over time I learned that razor clamming is sometimes challenging, sometimes cold and wet, but always fun. 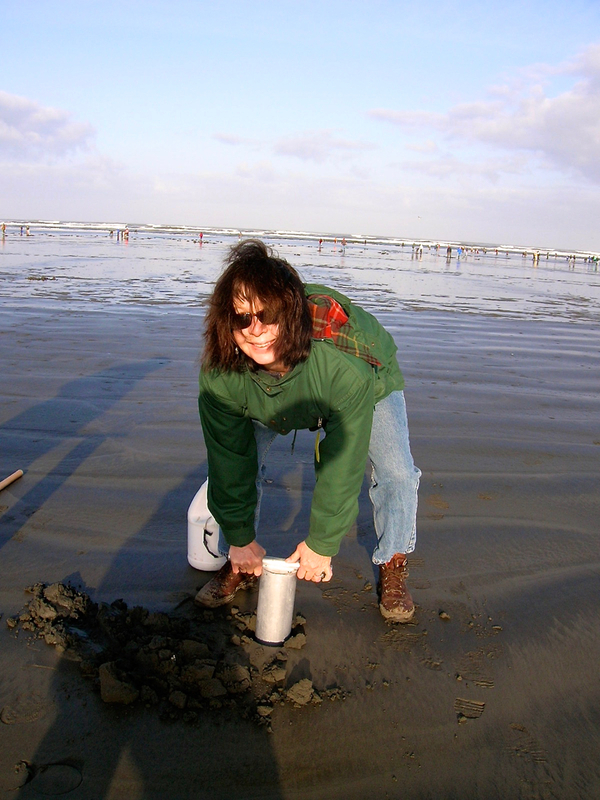 My wife and I eventually had many questions about the activity and the razor clam itself, which led to writing Razor Clams: Buried Treasure of the Pacific Northwest. In researching the book I discovered just how important the resource has been for the region’s history and identity. The clams were an important food source for coastal Northwest Native Indians and early settlers. Large-scale commercial exploitation began after 1900 with canned razor clams becoming a cupboard staple. 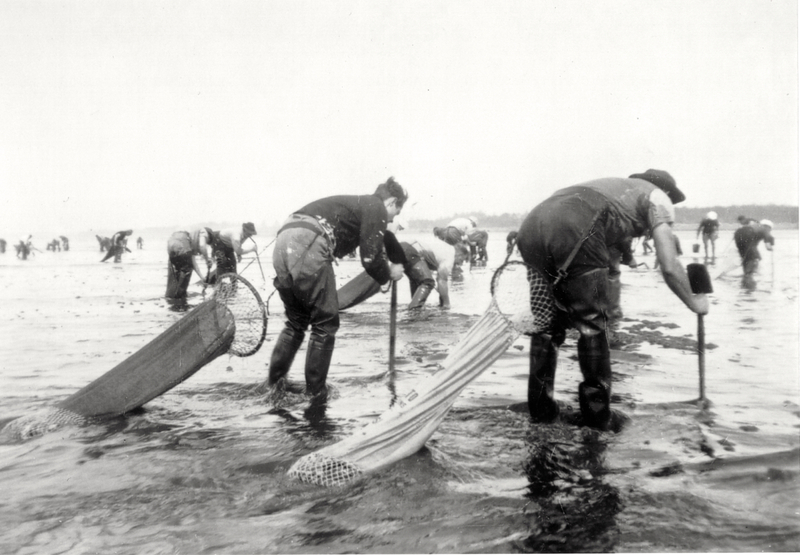 Following WWII, commercial canning petered out, but the undertaking as recreation continued to grow, and today razor clamming regularly attracts folks of all ages armed with shovels, tubes, buckets, nets and a shellfish license. For many people it is their favorite outdoor pursuit, a profound family-centric experience, part ritual and part way of life. Other natural resources have fallen by the wayside, but razor clamming and its time-honored rhythms endure. The photos below show key aspects of the modern recreational fishery as well as iconic moments from the past. 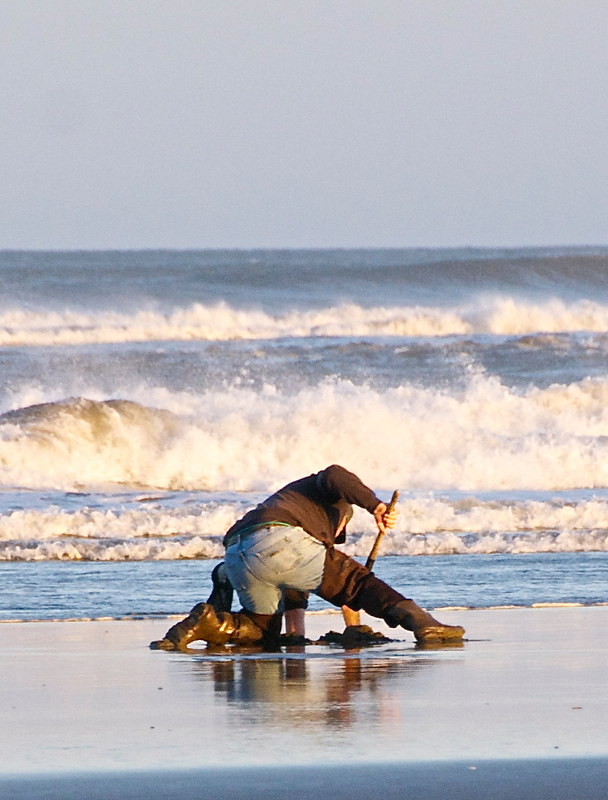 Digging for Pacific razor clams near Copalis Beach in Washington state. A good low tide and favorable weather can bring out a horde of people. 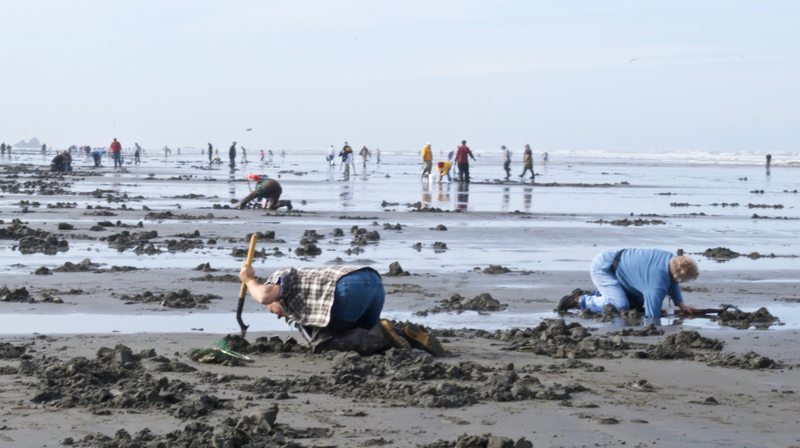 Razor clamming is a quintessentially Northwest phenomenon. This woman is using the tube to remove a coring of sand and, with luck, a razor clam as well. While the Northwest is famous for shellfish such as oysters and mussels, most of these are farm-raised. Pacific razor clams, by contrast, are only available as a wild food. A family heading to the surf with aluminum tubes and buckets. 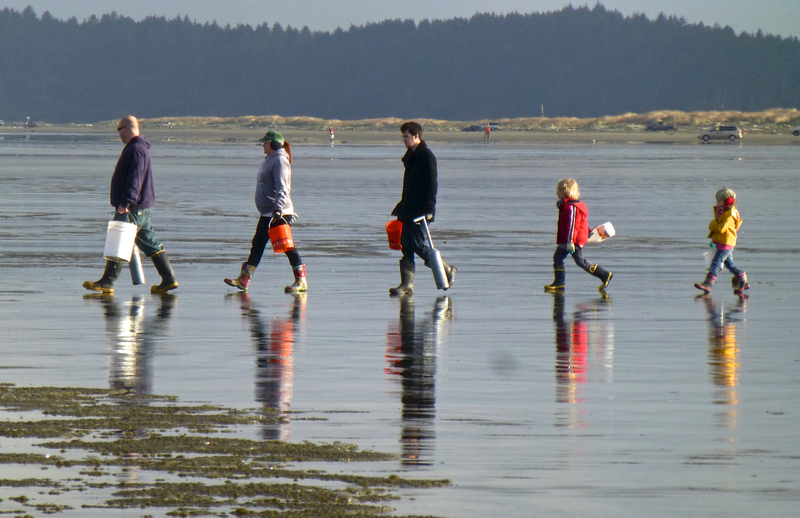 Razor clamming is a family-centric activity, one of the qualities that make the undertaking so special. Some people are darn serious about getting their legal daily limit of clams. This gentleman is using a special narrow-bladed shovel to dig for clams. Razor clams are wily and can move down quickly in the soft sand near the water. Shovel diggers by the surf must be quick about their business. The quarry, the Pacific razor clam. A variety of clams around the world are called razor clams, but this species, Siliqua patula, is only found on the West Coast on certain beaches from northern California to south-central Alaska. It is a large, meaty clam prized for the table. To prepare, razor clams are removed from the shell, cleaned of sand and viscera, and then fried, sautéed or made into chowder. 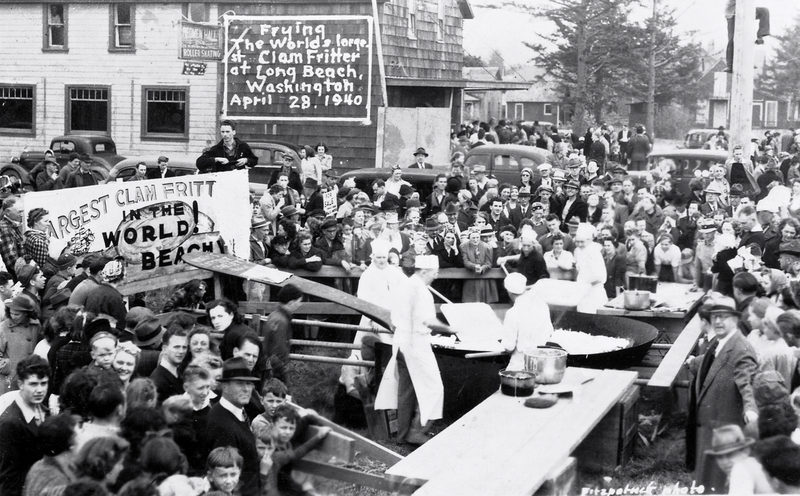 A razor clam festival in Long Beach, Washington in 1940. A highlight was cooking the “world’s largest clam fritter,” in a giant skillet. The fritter required two hundred pounds of razor clams and twenty dozen eggs. Like salmon, razor clams are an icon of the region and part of cultural identity. In Long Beach, WA, visitors love to take pictures next to a wooden razor clam sculpture as well as the original pan from the 1940s razor clam festival. The razor clam squirts on the hour and is squirting here if you look closely. 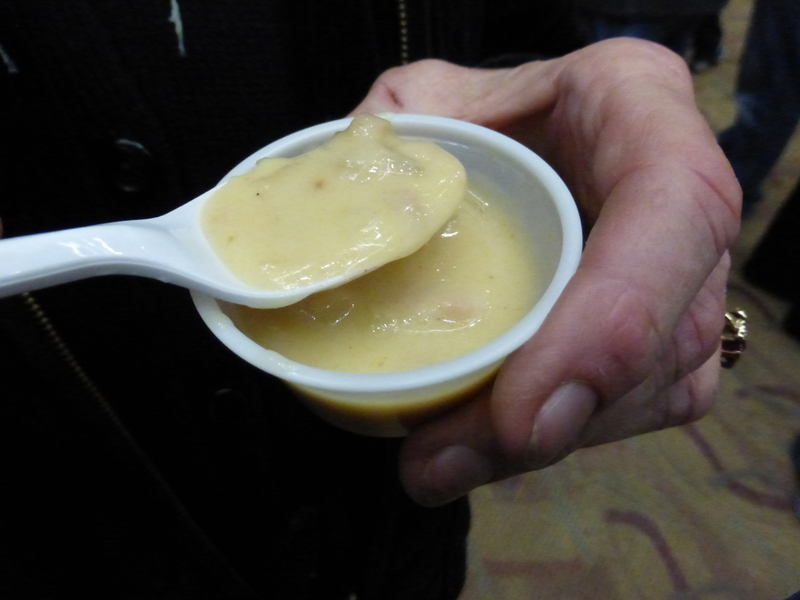 A cup of razor-clam chowder at the Razor Clam Festival chowder competition in Ocean Shores. 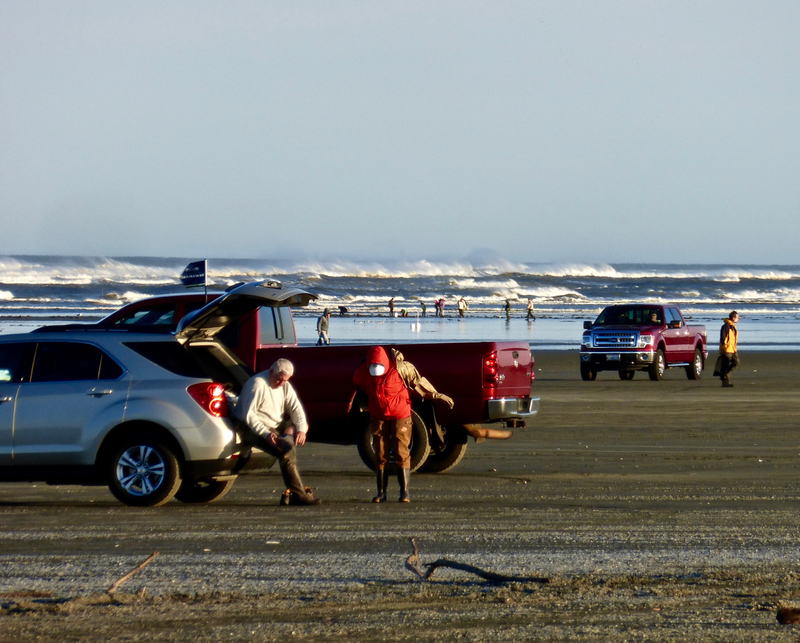 Acknowledging the razor clam’s importance and enthusiastic supporters, Washington state has two razor clam festivals each spring, one at the city of Long Beach, the other at the city of Ocean Shores. 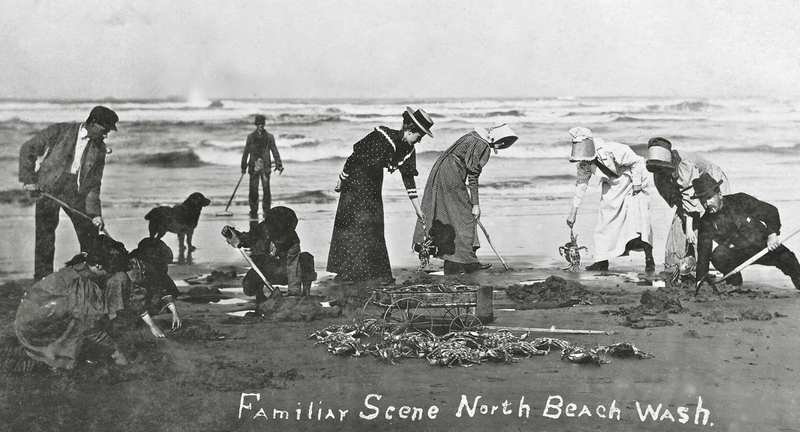 Women and men in 1910 collecting razor clams and Dungeness crabs. The clams are in the wire-wheeled cart in the middle of the photograph. Razor clams have been popular for as long as there have been people on the coast including among the original Native American inhabitants. Commercial clammers with surf sacks harnessed to their bodies. They were collecting primarily for the razor clam canning industry and could easily gather several hundreds of pounds on a good low tide. The canning of razor clams faded away in the post-WWII 1950s era. 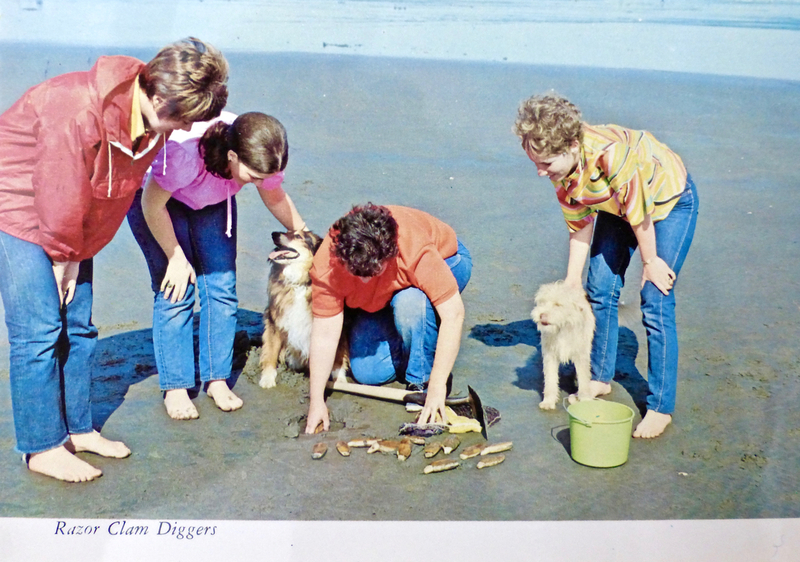 In the 1960s and 1970s, the number of people digging razor clams recreationally swelled as folks realized they could drive to the beach with the family, enjoy the seashore, dig some clams, and have a fine meal of the tasty bivalve. In Washington and Oregon people are allowed to drive on the beaches. Utilizing a vehicle helps make the activity easier to undertake regardless of the weather, which is sometimes cold, wet, and windy. 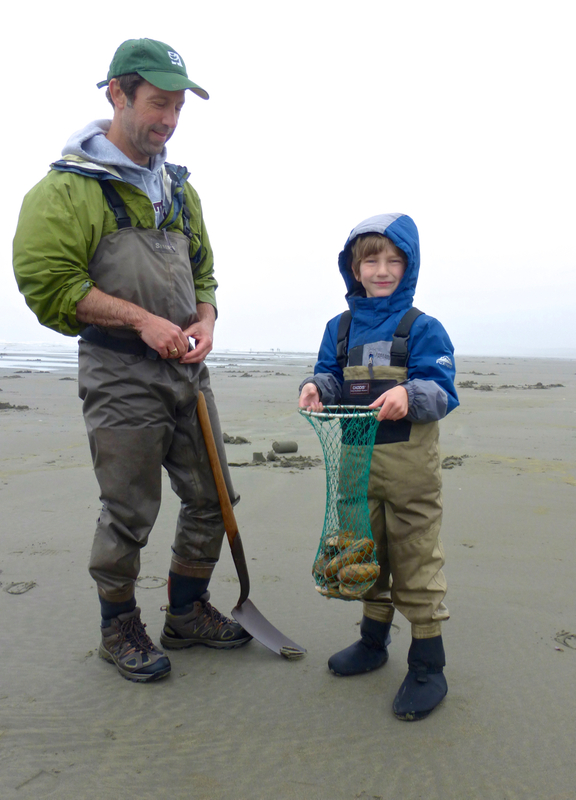 Father with his son and a net full of clams, in 2014. 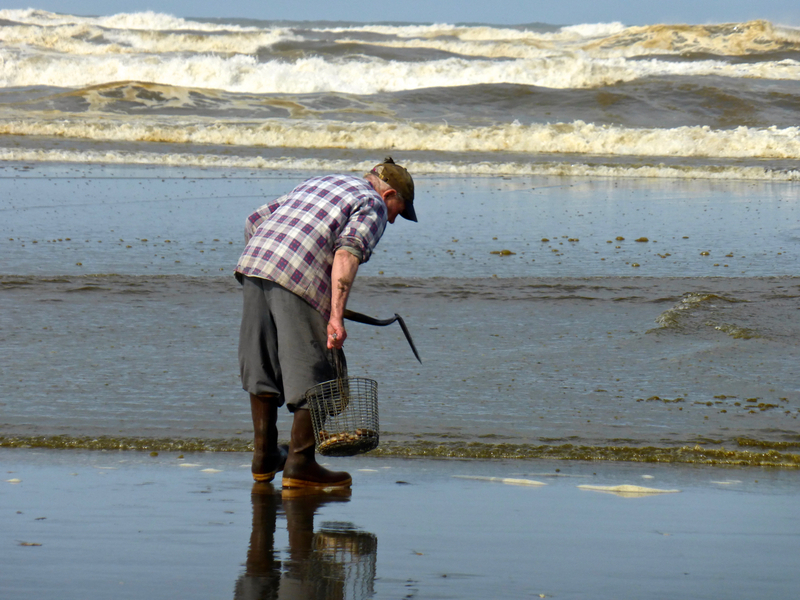 Despite the emergence of “nature-deficit disorder” and such distractions as professional sports teams and video games, razor clamming remains a living tradition in the Northwest that attracts many tens of thousands every year. David Berger has been a contributor to the food feature, “Northwest Taste,” in the Pacific Magazine, and is former art critic for the Seattle Times. He is a recipient of a Metcalf Fellowship for Marine and Environmental Reporting. This entry was posted in Events, Guest Post, History, Pacific Northwest, US History, Western History and tagged David Berger, Pacific Northwest, Razor Clams on June 11, 2018 by uwpressblog.